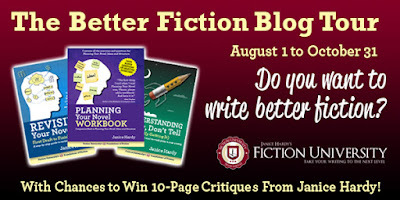 Today's stop on the Better Fiction Blog Tour discusses Fixing Fatal Flaws in a Half-Finished Manuscript at Anne Allen's blog (with another chance to enter to win a ten-page critique). Come on over and say hello! NOTE: Link has been fixed. Sorry about that. Hi there! Looks like the Fatal Flaws link is broken. I was really looking forward to reading thsy one too. Sometimes the lack of stakes are mine. That is, the publishing 'game'feels as if it's completely out of my reach. There are times I 'lose the plot' and the will to finish another novel that will sit on a dusty shelf in the corner of the jungle. It can take the fun out of finishing a long complicated story. I'm flagging with novel number nine. Ooo that can be rough. It's hard sometimes to write when we worry about the end game and whether or not something will sell. It's easy to say "just write the stories that you feel passionate about but it's much harder to actually stick with it when you're frustrated.